Club3D introduces two new Radeon HD 7750 graphics cards. The first model is the Radeon HD 7750 with 1GB DDR3 clocked at 1600MHz , this card promises to be 12 percent cheaper than the Radeon HD 7750 with 1GB GDDR5 clocked at 4500MHz, but it will also be somewhat slower. The second model makes less sense, the company decided to release a Radeon HD 7750 with 4GB DDR3 memory clocked at 1600MHz. This mainstream card doesn't need much more than 1GB of memory, 2GB is already a stretch but 4GB is just a waste of good memory. Both cards feature a single-slot cooling solution with a 50mm fan. 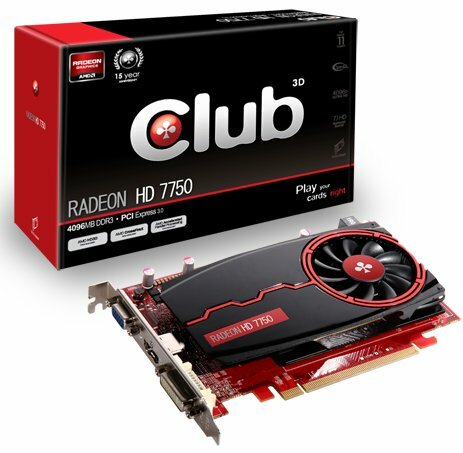 Club 3D presents today its latest addition to the Radeon HD 7000 series, the Radeon HD 7750 4GB DDR3 and Radeon HD 7750 1GB DDR3 graphic cards. The Radeon HD 7750 4096MB DDR3 offers an incredible amount of memory frame buffer for those budget minded gamers and the Radeon HD 7750 1024MB DDR3 comes at 12% lower price compared to the Radeon HD 7750 1024MB GDDR5, offering great value. Both cards utilize a custom cooler design with a single slot 50mm fan that ensures the card to remain cool at 57 ?C on average when gaming, extending the lifespan of the card and operate stable at high speed. The Radeon HD 7750 DDR3 cards also consume 3W less power under load and is fully powered through the PCI Express interface, meaning it does not require an external power connector, offering more compatibility with older generation power supplies. Run games at full HD by upgrading from your old onboard graphic card and boost performance by up to 7x compared to previous generation Radeon graphic cards. Add more and faster memory and enhance your internet experience, watching online video's, photo and video editing has never been this smooth and fast, experience true speed with the Club 3D Radeon HD 7750 4096MB DDR3.